But I won't let all of that get in the way of getting some much-needed organizing done. 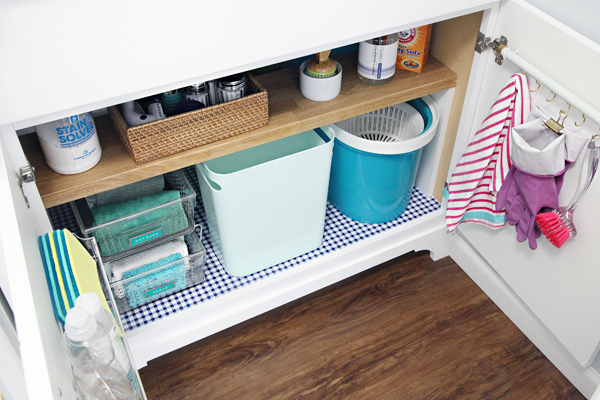 Today I wrapped up the installation of Parker's new closet (which we absolutely love), and I am also sharing with you some organizing I did in our laundry room under our new sink! 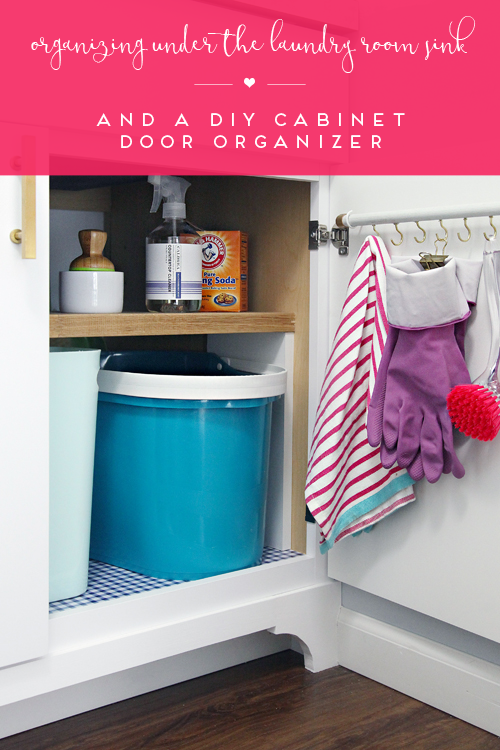 Last week I revealed our newly organized dining room cabinets, and during my recent travels to Texas to visit my dear friend, Grace, I was able to squeeze in a couple of organizing projects there as well! Our tools may be the first thing on our list in February at this point, but I am still feeling really excited about all of the fun I have been having doing exactly what I love. 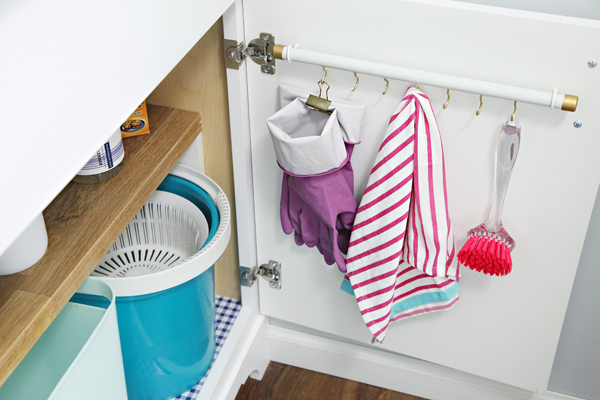 Prior to starting our recent laundry room makeover, we had a very used and loved and dated laundry sink. However, I wouldn't dare wash anything more than paint brushes in that sink! It had definitely seen better days. So we installed a new sink and added a darling decorative toe kick, and now it became my goal to make it functional enough to eliminate our previous stash-and-dash ways. 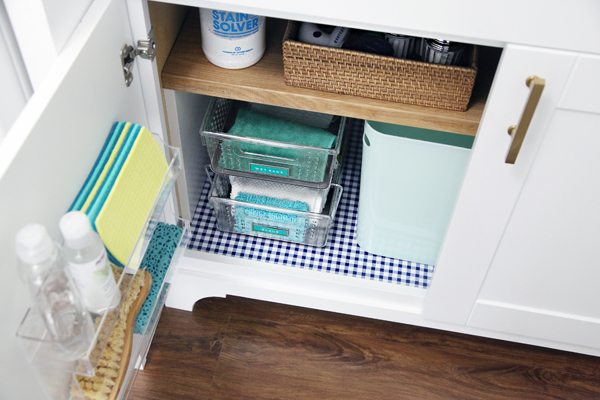 Whenever a blank slate is involved, out comes the handy dandy shelf liner! 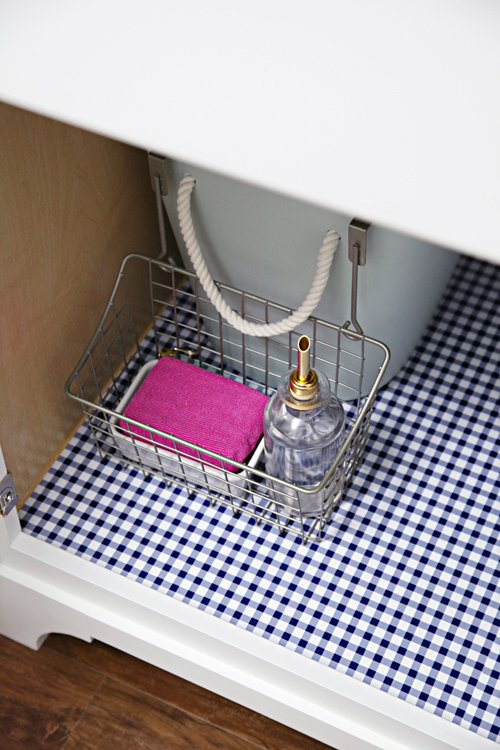 The blue gingham was a happy start and continues to perform random acts of happiness every time the cabinet doors open. To finish up the space I made myself a list of the items we utilize in this area frequently, took dimensions of the cabinet doors and interior, shopped our house and then made an excuse to head to The Container Store. We are ridiculously smitten with how well the area under our kitchen sink performs, and it served as inspiration for this space as well. In fact, I knew right away the doors would be the stars of the show, and thought about how I could utilize each to hold my most frequently reached for items. 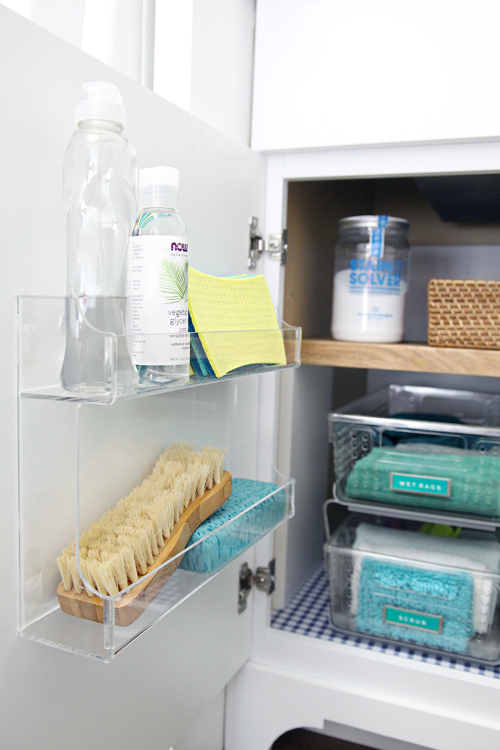 Because the acrylic spice rack on our kitchen cabinet is my absolute favorite door organizer, I opted to do the same thing here (installed with clear Command Strips). 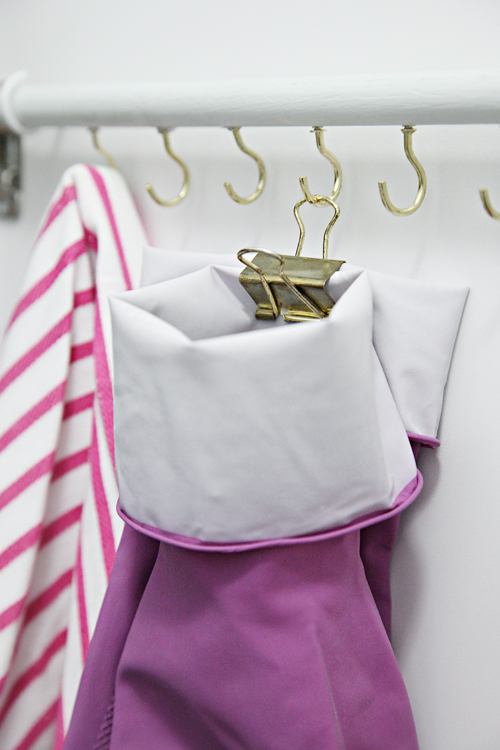 But for the other cabinet door, I decided a row of hooks would be ideal. 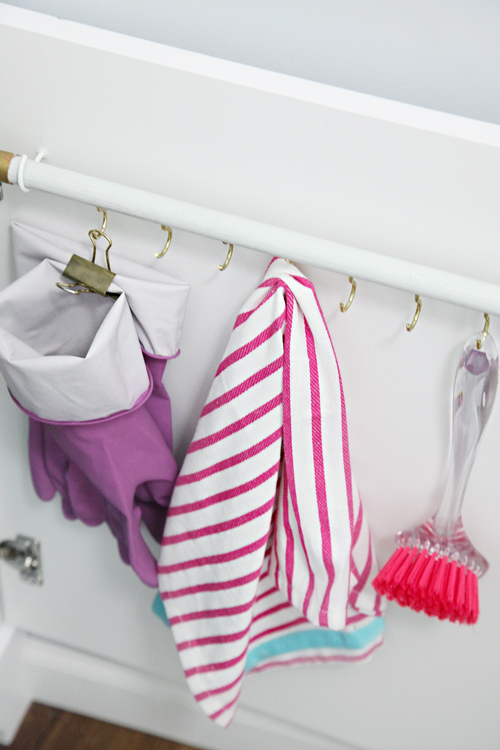 With hooks I am able to hang rags and towels, scrub brushes, paint brushes, and cleaning gloves. 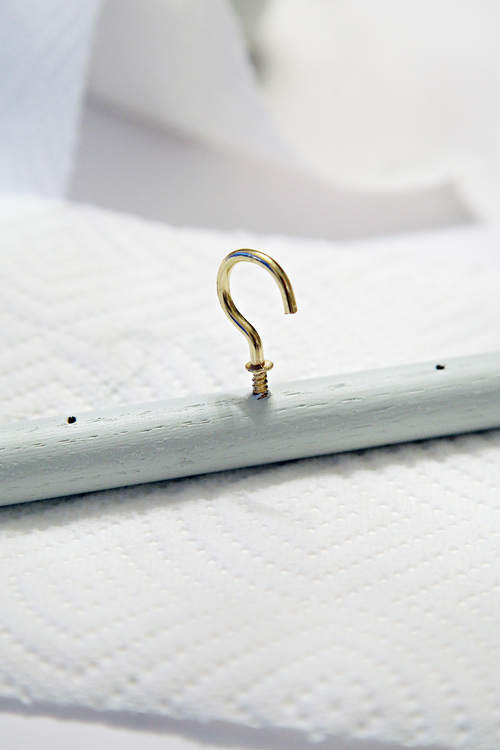 Wanting a little flexibility, my initial thought was to add a rail paired with "S" hooks. However, I didn't like the idea of the hooks sliding all over the rail as the door is opened and closed, so I went to Plan B which included a wood dowel paired with cup hooks. To make this simple DIY rail of hooks, I measured the door and then used that measurement to determine the overall length of the rail. 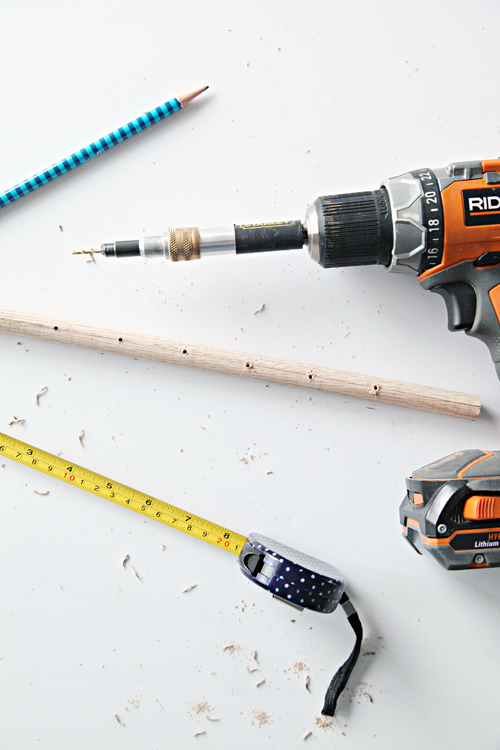 I cut the dowel accordingly with a small saw and used a pencil to mark even hook holes (about 1 1/2" apart). I used our drill to pre-drill the marked holes, sanded everything down, painted the dowel and then screwed in the 1" cup hooks. The ends were a little rough, so I hot glued two 1/2" copper caps to each end. I used some gold Rub-n-Buff to change the finish of the copper. I pre-drilled the cabinet doors and attached the rail using two more cup hooks. I love that there is some flexibility with the number of hooks and what might need to hang there down the road. 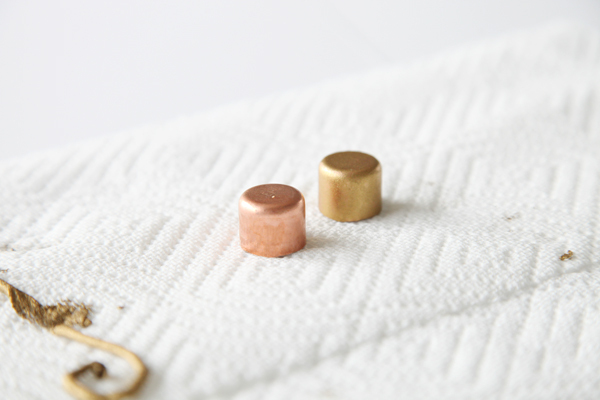 And a major heart filled sigh about the little bits of gold accents. I attempted to add grommets to my gloves after reading the tip in my Martha Stewart Organizing book, but the gloves were too thin and wanted to tear so a simple binder clip was an easy alternative solution. Under the sink was a completely blank slate, so I gathered items we already had and paired them with a couple of new things. This hot spot has to hold our large mop bucket as well as a small trash can for lint and emptying pockets. 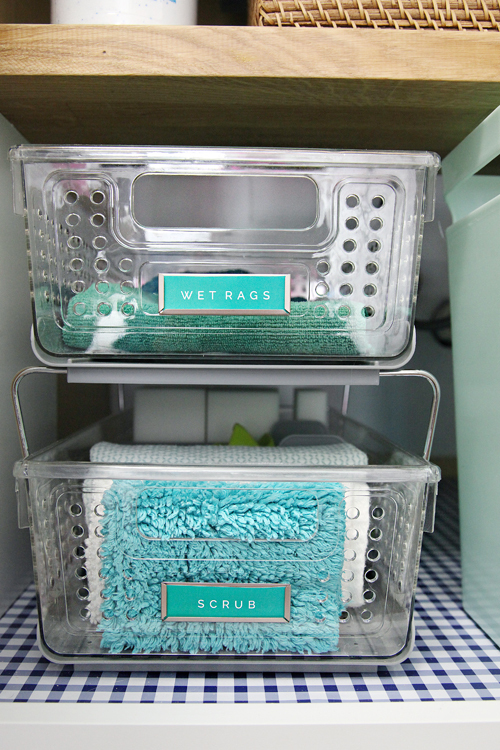 Although the bulk of our supplies for cleaning live in the cleaning cabinet on the opposite side of the room, I wanted to store some of the daily basics right here. That includes magic erasers, sponges, scrub brushes, cleaning gloves and rags. And those wet and dirty rags also needed a place to go until wash day. 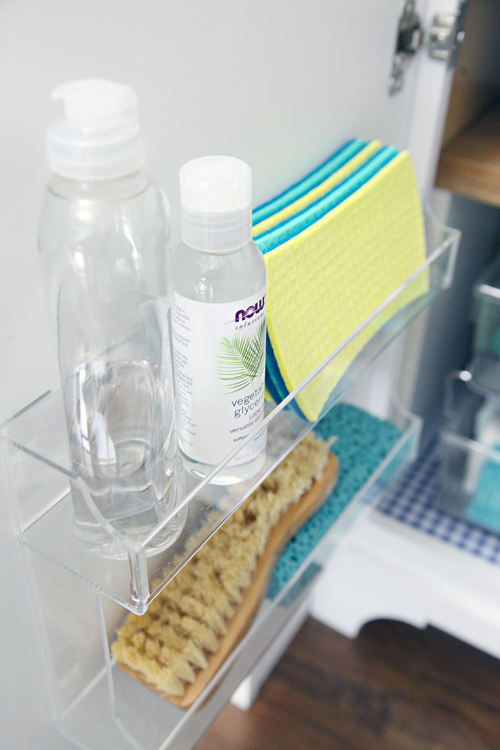 I found a pull-out cabinet organizer, which was stacked and super easy to keep clean. 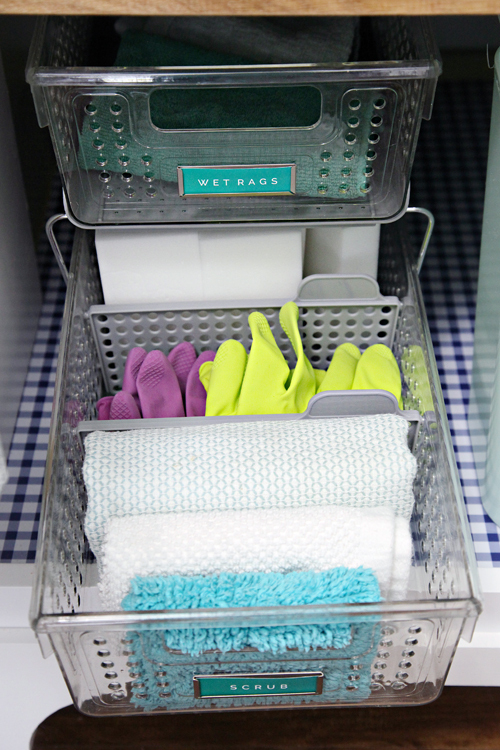 I knew it would be the perfect place to store extra rags, sponges, and gloves (and I also love that it came with adjustable dividers). The top bin is great for tossing dirty and wet rags. So the clan also knows what is happening inside of these pull-out drawers, I added labels using my new favorite adhesive label holders. There is a small lip on the bottom of the cabinet, but the raised frame ensures the drawer can still pull out completely without snagging on the cabinet trim work. 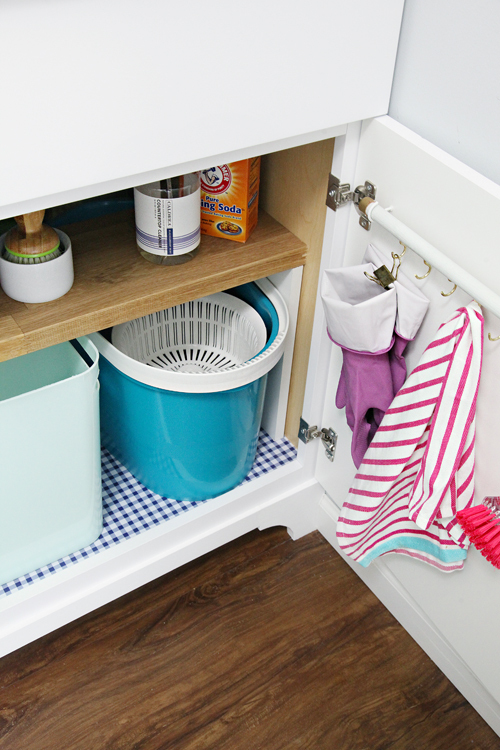 I liked the idea of a small and lightweight trash can for lint and quick laundry room cleanups and I also appreciate that it is really easy to clean out in the sink if necessary. The mop bucket rounds off the floor of the cabinet tour. I brainstormed a few ideas for how I wanted to make the most of the vertical space in this cabinet, as well as what I still had left to store, and ultimately decided to install a temporary shelf. That's right, temporary because it is not affixed to the cabinet, but it is snuggled in nice and tight. We had some leftover butcher block from another project, so we ripped down a piece and paired it with two slim boards that were also cut to the same depth. The two end boards were slightly taller than the mop bucket and trash can, and act as support for the shelf that was cut to length. Instant extra storage! 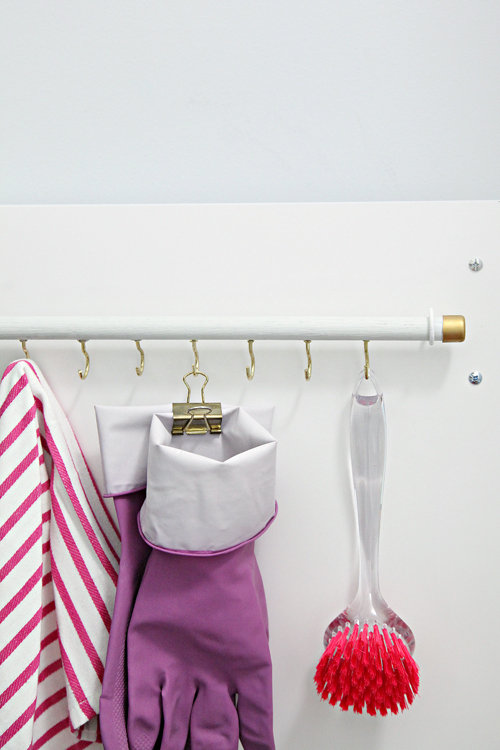 The shelf holds some laundry care items; specifically, things I use for treating stains and caring for garments. I used an old cleaning bottle and mixed some water and vinegar. 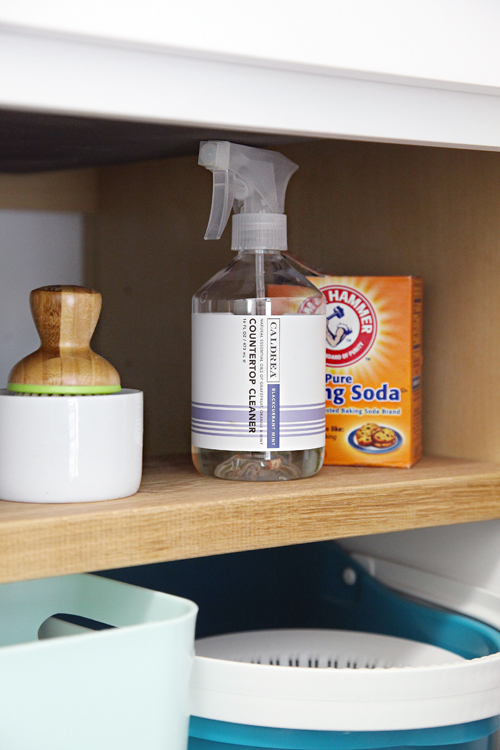 It is my "go-to" homemade cleaner and it works really great for everyday messes, but it is especially amazing when paired with a scrub brush and baking soda. Because the "before" photo was essentially a blank, empty cabinet, I will just celebrate the now functional and organized "afters"! 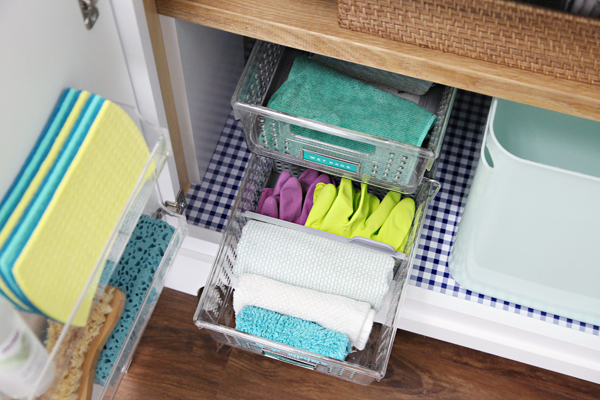 How are your January organizing projects going? Have you been able to find a good mix of play and project time? I love how you have transformed this space! 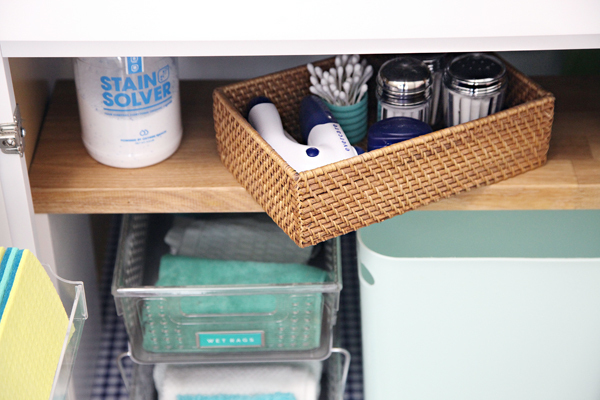 You have a great eye for organization. I'm curious if the door on the left closes. With that clear storage unit on the door it looks like the stuff in the cabinet would need to be pushed back. It looks like it might even hit the shelf but that may be an optical illusion. My shelves are flush with the inside of the cupboard so I can't hang things on the door. How do you deal with that? Hi Ann! I made sure when measuring everything out that both doors would close. You can see a few shots where I showed a door closed with the shelf inside. The shelf can move forward and back due to the size we cut it, and again, because it is not permanently affixed. I also love that the spice rack is only about 3" deep, making it great for dish and cleaning supplies without taking up much space. I love what you did with this space! Great ideas! I especially liked the dowel with the hooks. I am going to give this a try. Thanks for the inspiration! I have a question about your temporary shelf. Did you attach the butcher block to the two slim boards, or is it just resting on top of them? If it is attached, how did you do so (nails/glue/other)? I love this idea and want to do something similar underneath my bathroom sink. Thanks! 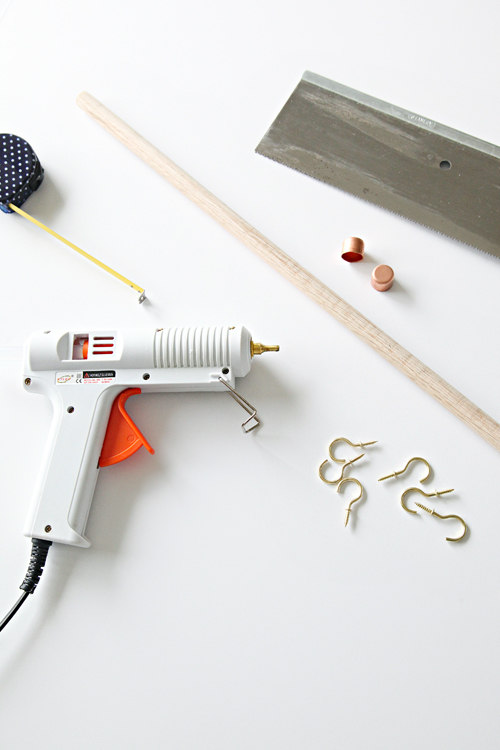 Okay, that little cup hook dowel rod thingie-ma-jig is genius!!!! Plus it looks cute! Do you like this option for dirty rags or your wet sack better? Thanks!! Reading your posts are always a treat and you are my inspiration too get up and start or continue a project. My question is what do you use the glycerine for?